Lily & Val Living - Page 3 of 64 - A pretty place for all who love the simple things in life. Hello, February! For this, the month of love (and not just romantic love! ), I wanted to create a drawing to help give yourself a little self-love, too. I think we could all use that reminder now and then. So, here’s a pretty, Valentine’s inspired floral design to help decorate your tech. Pass it on to a friend and spread the love this month. You are lovely! I hope you enjoy! This is a great time of year to stay cozy at home. That means it’s also a great time to refresh your living space, get organized, clean, and make your home a beautiful place to spend these chilly winter days. Check out some of our favorite small business and hand made decor items to make your home a little extra special. This beautiful wreath is the perfect addition to your winter decor. A little flower to bring on spring and lots of fresh greens and whites. If you are like us…your cozy throw collection is out of control! This handmade throw ladder is the perfect place to keep your throw blankets organized and accessible. The best part is it lets your blankets double as beautiful decor in your space. Speaking of throw blankets… why not add another. I love this cool blue aztec print throw. I love to change throw pillows and throw blankets around throughout the year. It’s a low cost, high impact way to refresh your space. Speaking of throw pillows (see what I did there)… I’m completely in love with this flower market throw cushion! The simple black and white color scheme is versatile and the flowers are will get you in the mood for spring. Motivating yourself with pretty storage solutions is a great way to inspire cleaning and organization. These beautiful felted and wood storage baskets will make you want to get all of your rooms sorted and refreshed. I hope you enjoy getting your space spruced up during this dreary time of year! Stay warm everyone! Ladies, it’s almost time to celebrate your gal pals. February 13th will be here soon so start planning your Galentine’s day get together! This year I wanted to plan a little “extra sweet party” for the sweetest people I know. To make my life super easy, and the get-together super cute, I used my Life of the Party Papercrafting Book! This is perfect to keep on hand for any time you want to make a dinner, party, or gift just a little more special. The theme of my Galentine’s get-together was Sweets! It’s fun to celebrate the sweetest and most wonderful qualities of the ladies you know. Who doesn’t need to hear a friend tell them what they think their best quality is? Oh, the menu for this party was coconut cookies, blueberry muffins, strawberry cream cheese mini bagels, candied pecan salad, and chocolate croissants topped off with homemade lavender lattes! To make each lady feel special and let them know how much you appreciate their unique personality, try writing each one a short and sweet note to tell them what you appreciate most about their friendship. I love these little candy motif napkin rings. They go perfectly with our extra sweet party theme and the pink and purple color scheme. Oh so feminine and cute! Having a menu on display is always fun and informative for guests. I love the menu from the “brunch” collection in paper crafting. To finish my menu off I mounted it on one of the beautiful scrapbook pages that coordinate with each collection in the book. This really helped to give my menu presence and a little pop of color to match the table. The blank cards in the candy motif were perfect for writing sentiments to each individual lady on the back. I placed these at each place setting, along with a small gift, tagged with her appropriate descriptor. For the tags, I pulled both from the sweet treats set and the more formal floral motif found in the book. My favorite thing about how this book is put together is that the color schemes are unique for each theme, however, so many components can coordinate depending on your color scheme. Add in some simple vases and a lovely table runner, made from cute coordinating Anthro tea towels, and voila! A sweet sweets brunch for all the sweetest ladies! It will come as no surprise that flowers are my absolute favorite thing to draw. I am constantly inspired by the natural variation in petals and foliage. No two petals or leaves are quite the same and that’s the attitude I like to keep when I draw them. When I asked on Instagram what you’d like to see more of, tutorials was at the top of the list! So, I’m pleased to bring you this free guide on how to draw my favorite flowers in chalk! I will show you how to draw 3 different flowers, but once you know the techniques, you can apply them to all types of florals! I can’t wait for you to see how the natural texture in the chalk and chalkboard surface will make your blooms come alive. As always, I invite you to embrace the imperfection in your drawings! This will give it character and charm. Remember, practice makes personality. Happy Chalking, friends! P.S. As always, you can find all of my tips and tricks in The Complete Book of Chalk Lettering! Enter your email address below and a PDF will be emailed to you with a password to open. Enjoy! Last year I started something new for January’s desktop download and I decided to letter my personal word of the year, which was Refocus. Declaring a word for my year has really helped me set an intention for many aspects of my life and actions. It’s less intimidating than a huge list of goals and I love looking back to see how that word has shaped the year. So, to continue that for 2019, I present to you my 2019 word: Progress. 2018 brought with it a slower pace and some clarity that I had been craving. It involved making sacrifices, changing my way of thinking, and taking a hard look at where I should be focusing my time and energy. I feel proud of how far I’ve come, but in many ways I’m still in that space, trying to make room in my life and business for what matters most. Sometimes I feel like I should be farther along and the temptation to beat myself up over unmet expectations becomes strong. So this year, instead of setting lofty goals and high expectations, I’m focusing on progress. Our best lives are built piece by piece and moment by moment. These tiny steps may seem trivial at the time, but they matter, move us forward, and add up. For me this year, it’s all about savoring and celebrating the small wins in every aspect of my life and giving myself grace. Progress over perfection. Perhaps you need the reminder to slow down and celebrate each win, no matter how small. When you get discouraged (I know I will too) I hope this desktop download helps move your attention to what’s important and brings some encouragement. Enjoy! Here’s to the best 2019! Happy almost New Year, my friends! As I sit down to write this re-cap, my heart is incredibly full. Last year at this time my mind was filled with uncertainty and tension. 2017 was a tough year, but one we desperately needed in order to learn and move forward. After declaring 2017 the “year of learning”, I made an intention to “refocus” in 2018 and I feel proud to say that although things are far from perfect, I have the sense that I am on the right track both personally and at Lily & Val. This “refocused” year brought with it big changes, the unknown, mind shifts, evaluating time spent. My motto became “work smarter, not harder.” It was uncomfortable at times as being in the “in-between” often is, but also marked with wonderful wins that helped me feel more confident in the direction I was taking. 2018 was taken at a slower pace, which I have been desiring, yet I feel good about what our team accomplished. As always, and I can’t say this enough, thank you to everyone for coming along on this journey! Most of all, I’m grateful for all of you because, without your support, there would be no re-cap to write! 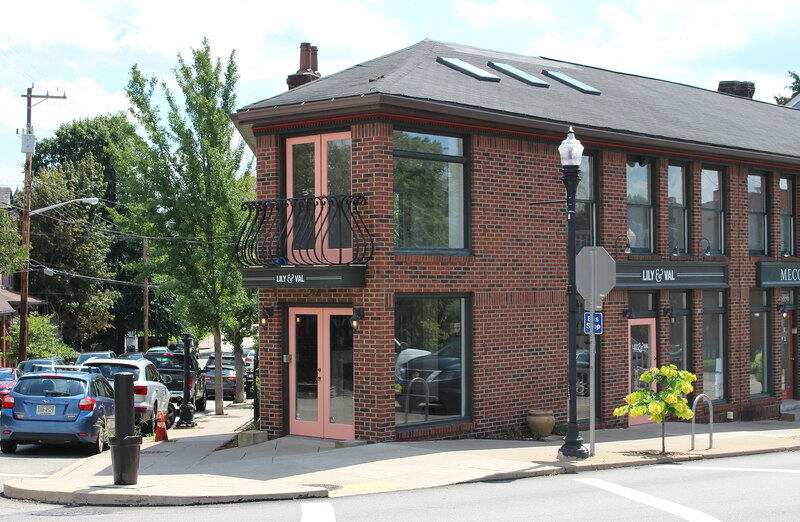 2018 kicked off with some bittersweet news when we made the very tough decision to close our brick and mortar store in Pittsburgh, PA. We called this store our “Flagship Store.” Many people asked why and the reason was because we had grand visions of opening up future Lily & Val stores! We made big plans and dreamed big dreams, but as Billy Joel said in Vienna, “Dream on, but don’t imagine they’ll all come true.” This particular dream ended in order to make room for taking Lily & Val in different directions. It’s still bittersweet- that’s really the only way I can describe it when I look back, but I know it was the right decision. I have far too much more to say about the store in this little re-cap, so please feel free to read the post I wrote at that time here. In February, I had the unbelievable honor of being named one of the Top 10 Designers to watch by Stationery Trends Magazine! Later in the year, our Wonder Woman card appeared on the cover of Stationery Trends! Also in February, we had a huge wholesale card order to fulfill! Now, finding ourselves without an office, we had to get creative and rented a room for two days at the Marriot! Two VERY late nights, lots of help from our amazing team, and we made it work. We realized we were going to have to get a bit scrappy and even though things didn’t look like I expected at many points, we made it happen in each instance this year. I’m so proud of that! The Complete Book of Chalk Lettering went into its SIXTH printing this year! What! It’s still surreal to me and also crazy that the book turned three this year. I never ever tire of seeing Lily & Val in stores! This year we expanded some wholesale relationships and I’m excited to share more about this in 2019! Below is a sign that was in Hobby Lobby. In March, we expanded with one of my favorite collaboration partners, Mixbook, to offer Lily & Val Wedding Photo Books! I love these books so much! 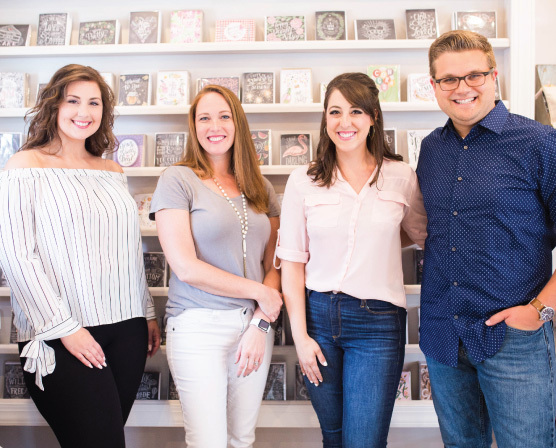 The rest of the year brought additional collaborations with Mixbook, which included new holiday photo cards, wedding invitations, a calendar, and a free class offered through Brit + Co. I enjoy working with them so much and being able to bring these new products to you this year! Also in March we released our Spring Flora Collection! I tried something brand new for this collection and worked on chalkboards with colored backgrounds! 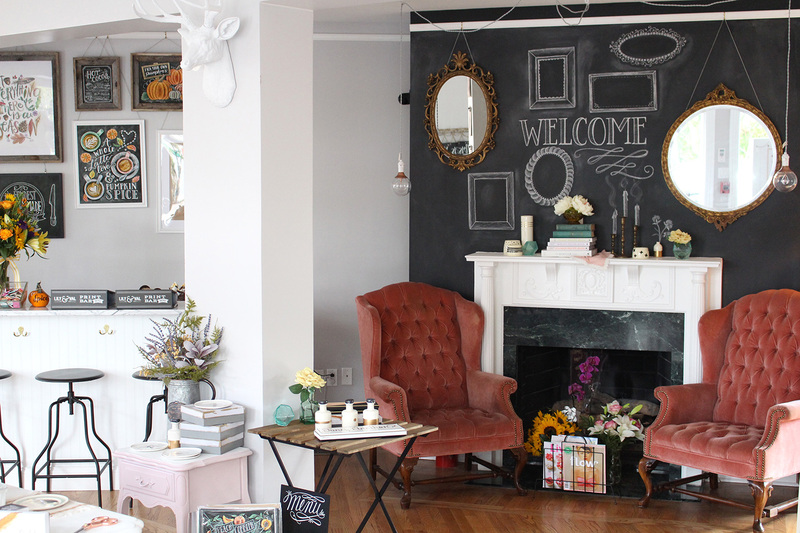 It was fun to experiment, try new things, and give classic L&V chalk art a springy update! April was National Letter Writing Month (one of my favorites) and we celebrated all month long with a surprise box, promotions, and other fun things. May was an eventful month! We released L&V pillows at the begninnging of the month. Then, I made my way to San Francisco for a special event with Brit + Co and Mixbook to teach a brush lettering class. The whirlwind of May continued with the National Stationery Show in NYC! This year we decided to drastically change up our booth and we unveiled our wedding collection, including our Wedding Guestbook! My brother, Neal, came along with Mak and me and we had a great time. The biggest highlight of the show was winning the Best New Product Award for our Wedding Guestbook! Ahhh! This product has been a long time in the making and I am so proud of it! In June, the folks from Focus Features asked me to draw a piece of art in honor of the documentary about Mister Rogers, “Won’t You Be My Neighbor.” I was ecstatic! (And many of you know I’ve been quite enamored with Mister Rogers and everything he stands for over these past many months!) It’s another memory we will treasure from 2018. In July, I decided to take a 7-day break from social media after talking to my friend Leah about her experience and transformation. My curiosity took over and I felt compelled. This experience had a profound effect on me and led to more discussion on this topic and personal reflection in the coming months. August brought another big piece of news for us this year and I announced that pre-orders were available for my latest book, “Life of the Party Papercrafting.” The book launched in September! The Holiday Season kicked off with our “Good Old Fashioned Family Christmas” Collection! We also launched two brand new products: meal planner pads and recipe tins! Celebrated the Lily & Val team (& their supportive spouses!) with a fun Christmas dinner at The Commoner in Pittsburgh. I’m so grateful for these people. And now, a bit of personal news to wrap up the year – Mak and I are expecting our first child in June! An answered prayer to make our holiday season extra bright. I think 2019 is going to be the best year yet. As 2018 comes to a close, I feel content and so excited for what’s ahead. A lot of big moments are shared here that blow me away, but so much more has happened in the in-between moments of growth, learning and self-discovery. Again, I can’t say thank you enough for your continued support and encouragement. It means the world to me. Thank you for following this little journey. For this month’s Pretty Ordinary Friday #100, we’re documenting snapshots of our month. While our pictures may not be the prettiest or the most interesting, we enjoyed each instance and want to remember them! These are the behind-the-scenes, in-between moments – the small peeks that would otherwise be forgotten. Join us as we use this series to scrapbook the unedited, memorable happenings at Lily & Val and what is inspiring our team! Friends, I wish I could tell you that I set out to whip up some cute, DIY packaging, but the truth is, I just ran out of time and needed some wrapping in a pinch! Without a stash of holiday wrapping paper (besides this beautiful black and cream Sugar Paper LA tissue paper I picked up at Target at the beginning of the season), I needed to create my own festive packaging. This idea ended up being very simple and I love how it turned out, so I thought I would share it with all of you in case you find yourself in a similar, last-minute wrapping situation. Luckily, I keep a roll of white kraft paper on hand at all times. No matter the season, you can ALWAYS dress it up with a cute ribbon, string, or hand lettering. I also had a simple white gift bag. Add to that: a string of red bakers twine + Tombow Dual Brush pens in a few shades of green, plus black and a brown and that’s all you need! The drawing technique I used on all three packages is very simple and similar for each. Just think of drawing upside-down “V” shapes with a tiny curve at the ends. The key is to keep it imperfect and loose. The best part about that is you cannot mess up. The messier the strokes, the more organic your trees and branches will look! Don’t overthink it, just quickly scribble out your brush strokes with the lightest green color first. Once your first layer of green strokes is down, add a few loose strokes in a darker shade of green on top. You don’t want to cover up your bottom green layer, just add a few stroke shadows to give a hint of dimension. On this large tree and small trees, I repeated the process using a third, olive green color, but two colors will do the trick just fine! You can add some messy tree stumps or just leave the greens as-is. You truly cannot go wrong! On the bag above, I finished it off with some small black dots to mimic the dots on the tissue paper. Creating greenery branches instead of a tree follows a very similar stroke pattern except you can add a long stroke, which becomes center of the branch with small strokes protruding off this center line. Again, keep it loose and imperfect. Actually being hurried is helpful here! Simple red bakers twine finishes off your packages and adds a festive touch! Easy and pretty wrapping done in a cinch! I just might wrap all my gifts this way! Happy wrapping, friends.